January 6, 2018 January 6, 2018 Dan O. So, I don’t know, maybe don’t adopt? Or something? Mark (Thomas Jane) and Jessie (Kate Bosworth) have been wanting to desperately have a kid, but they just can’t, so they decide to adopt a cute and nice little eight-year-old named Cody (Jacob Tremblay) who, inexplicably, has been without a family for quite some time. And while it takes awhile for them to get used to each other, eventually, they begin to grow into their own little family, where they mess around, get along, and generally have a great time together. But that all begins to change when weird, downright spooky things begin happening and no one really knows why, except for Cody himself. And then, it all becomes evidently clear why Cody has been by his own for so very long and Mark and Jessie have no idea what to do. Should they give him back and move on to the next kid and hope that there’s not some evil spirits following them around? Or stick it out with Cody and treat him as one of their own, fight these spirits, and live together in perfect harmony? 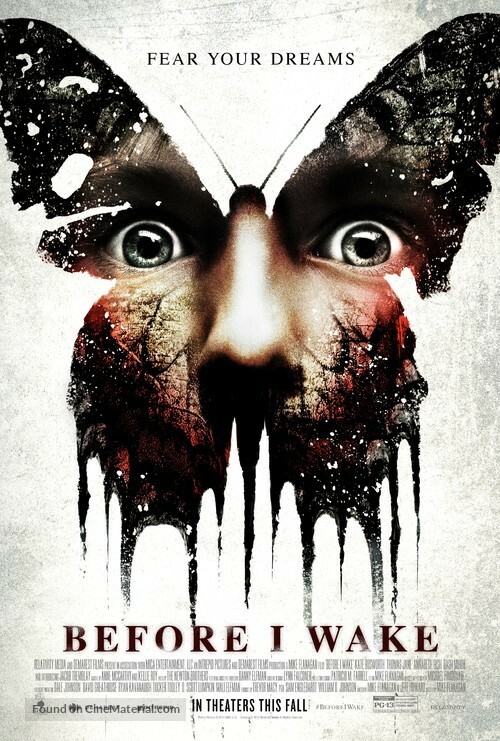 Before I Wake has, infamously, been trapped in release-hell for the past few years and I’m not really sure why. The movie isn’t all that awful to the point of where the studio involved would feel ashamed to ever release it, nor is it really all that great to begin with. It’s the kind of movie that gets made, doesn’t have much hype behind it, and of course, due to some other random business-reasons, gets lost in the shuffle, is known and/or talked about, and eventually, gets released to the wide masses. But why did Before I Wake take so long? No clue. And really, I don’t care. Had the movie stayed on the shelf longer, I would have been perfectly fine with that, because while I do appreciate how Mike Flanagan is trying to single-handedly change the game of horror, after this and Gerald’s Game, I hate to say but I’m growing a little worrisome. Granted, Gerald’s Game was a tad more inspired than this here Before I Wake, but both suffer from the same problem in that there just isn’t much of a story to really work with; Before I Wake does, thankfully, benefit from a solid family-dynamic, but never focuses on it enough to where it’s completely effective, the way it should have been to heighten the emotional drama. Instead, it’s much more focused on the ghouls, ghosts, and butterflies that mysteriously begin to pop-up and yeah, it just takes away from everything else. Of course, I’m not one to say that Before I Wake didn’t need all this horror in the first place, because it’s most certainly Flanagan’s wheelhouse, it just doesn’t feel necessary. It’s like the Babadook in that we actually deal with some real issues about love, about family, and about surviving together, as one, except that Before I Wake only occasionally passes on these ideas and themes, only to then get distracted by the spooky stuff. And it doesn’t work, really, because the spooky stuff either doesn’t make sense, or isn’t even all that scary; it’s a little cheesy, a little schlocky, and because we don’t totally care about what happens to the characters, a little dull. That said, the cast gives it their all, with Thomas Jane putting in a pretty great performance as the dad of the family. Jane seems like he’s in a totally different movie where he’s cool, funny, and always one step ahead of the plot. Which is why it’s a shame that he gets saddled with a role that, honestly, would have been better in a much more character-based drama. Kate Bosworth is good, too, in that she has to handle a difficult role in being the matriarch of the family and it works. Tremblay is fine, too, although, because he was so young and because his role wasn’t all that demanding, doesn’t get a whole lot to do. Or, at least, not as much as he would continue to do in the next few years or so. Something everybody else involved with this movie would be doing. Consensus: Though it does aim for some heartfelt notions about love and family, mostly, Before I Wake‘s a dull, unemotional, and unscary horror flick that could have stayed on the shelf for a lot longer, or even, forever. Oh, and there’s a ghost-creature. Or something. The original distributor of this film, Relativity Media, filed for bankruptcy. It took some time for the company to divide or dissolve its assets. I think the movie sat on the shelf, not necessarily because they were ashamed of the movie, but because the rights had to be sold to someone else. I saw it several months ago with little to zero expectation, but in the end I think it was pretty impressive. Yeah maybe it’s not really that interesting if it’s seen as a pure horror film, but as a family-drama I think the plot was arranged pretty well.